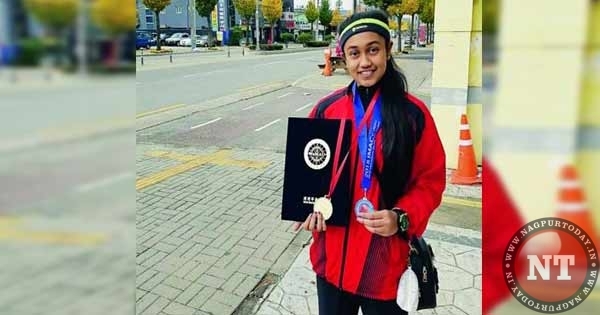 Nagpur: City’s 14-year old Sanya Pillai won gold medal at the 3rd World Junior Shikai Martial Art Championship held in South Korea recently. Sanya took part in 54 kg Group Under 17 category. Players from 19 countries participated in the event. Sanya won the gold medal against the tough competition by rivals from Laos, China, Philippines, and Koran players. She is daughter of Manoj and Khushi Pillai and Class IX student of Centre Point School, Katol Road. Making forays into the martial art for keeping hr fit, Sanya has proved her mettle in Kickboxing, Taekwando, and Shikai martial art. Being a Brown Belt holder in senior group, Sanya has so far bagged 42 medals including 32 gold medals in various contests. On her return to Nagpur and talking to media persons at airport, she said, “The temperature in South Korea was too cold as compared to India. But we blended well with the conditions. The rivals were experts in kick and agility. Watching them closely, we planned our strategy for a win. Talked to coach on how to tackle the rivals. All these aspects helped me emerge winner,” Sanya said.